When we visit a friend or go to the beach, our brain stores a short-term memory of the experience in a part of the brain called the hippocampus. Those memories are later "consolidated"—that is, transferred to another part of the brain for longer-term storage. A new MIT study of the neural circuits that underlie this process reveals, for the first time, that memories are actually formed simultaneously in the hippocampus and the long-term storage location in the brain's cortex. However, the long-term memories remain "silent" for about two weeks before reaching a mature state. "This and other findings in this paper provide a comprehensive circuit mechanism for consolidation of memory," says Susumu Tonegawa, the Picower Professor of Biology and Neuroscience, the director of the RIKEN-MIT Center for Neural Circuit Genetics at the Picower Institute for Learning and Memory, and the study's senior author. The paper's lead authors are research scientist Takashi Kitamura, postdoc Sachie Ogawa, and graduate student Dheeraj Roy. Other authors are postdocs Teruhiro Okuyama and Mark Morrissey, technical associate Lillian Smith, and former postdoc Roger Redondo. Until recently, there has been no good way to test these theories. Most previous studies of memory were based on analyzing how damage to certain brain areas affects memories. However, in 2012, Tonegawa's lab developed a way to label cells called engram cells, which contain specific memories. This allows the researchers to trace the circuits involved in memory storage and retrieval. 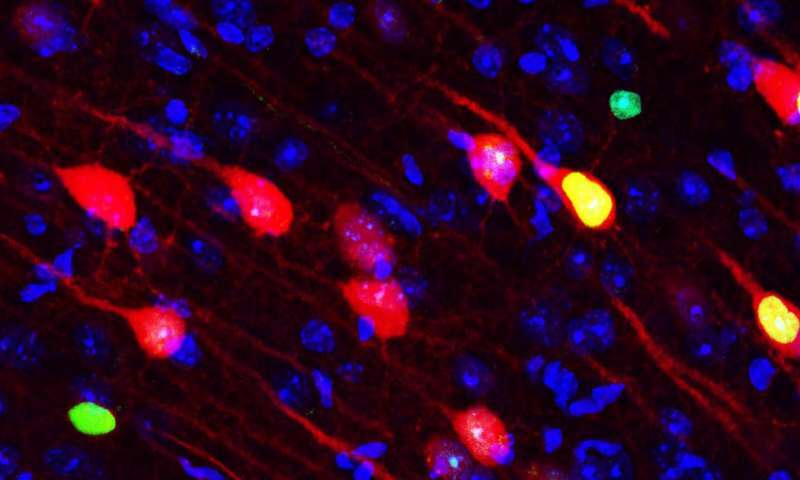 They can also artificially reactivate memories by using optogenetics, a technique that allows them to turn target cells on or off using light. In the new Science study, the researchers used this approach to label memory cells in mice during a fear-conditioning event—that is, a mild electric shock delivered when the mouse is in a particular chamber. Then, they could use light to artificially reactivate these memory cells at different times and see if that reactivation provoked a behavioral response from the mice (freezing in place). 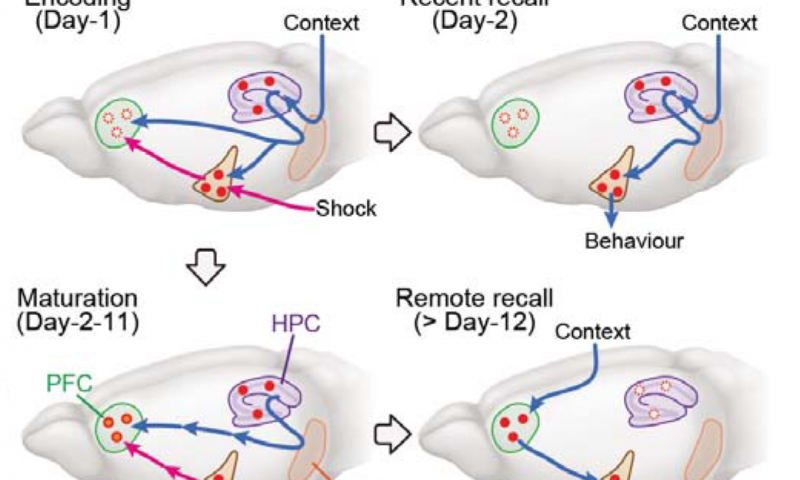 The researchers could also determine which memory cells were active when the mice were placed in the chamber where the fear conditioning occurred, prompting them to naturally recall the memory. The researchers labeled memory cells in three parts of the brain: the hippocampus, the prefrontal cortex, and the basolateral amygdala, which stores memories' emotional associations. Just one day after the fear-conditioning event, the researchers found that memories of the event were being stored in engram cells in both the hippocampus and the prefrontal cortex. However, the engram cells in the prefrontal cortex were "silent"—they could stimulate freezing behavior when artificially activated by light, but they did not fire during natural memory recall. "Already the prefrontal cortex contained the specific memory information," Kitamura says. "This is contrary to the standard theory of memory consolidation, which says that you gradually transfer the memories. The memory is already there." "They're formed in parallel but then they go different ways from there. The prefrontal cortex becomes stronger and the hippocampus becomes weaker," Morrissey says. Kitamura says he believes that some trace of memory may stay in the hippocampus indefinitely, storing details that are retrieved only occasionally. "To discriminate two similar episodes, this silent engram may reactivate and people can retrieve the detailed episodic memory, even at very remote time points," he says.